Political analyst Bridget Welsh said the Hougang by-election results were no surprise and said that the People’s Action Party had miscalculated in its campaign. Welsh was referring to the campaign hustings, in which DPM Teo Chee Hean repeatedly questioned the credentials of WP candidate Png Eng Huat. “The reasons are two-fold. The PAP tactics are outdated,” said the professor at the Singapore Management University. On the PAP’s future, Welsh felt that the party should rethink its approach and engage voters more through genuine and respectful dialogue. For the WP, this election highlights the need to address the candidate selection process and improve transparency, Welsh said. Png garnered 13,447 votes or 62.09 per cent of the total to become the single member constituency’s Member of Parliament-elect, succeeding Yaw Shin Leong, who was expelled from the WP in February after reports of alleged marital indiscretions. Png’s rival, PAP candidate Desmond Choo, got 8,210 votes or 37.91 per cent of the total votes, a better showing than the 35.2 per cent share he garnered against Yaw in the May general election last year. Another political observer, law professor Thio Li-ann, said that it will be tough for the PAP to wrestle away the Hougang seat even in the long run. The single-member constituency has been a WP stronghold since 1991and she said Hougang voters are not easily swayed, either by promises of upgrading nor personal attacks on opposition candidates. 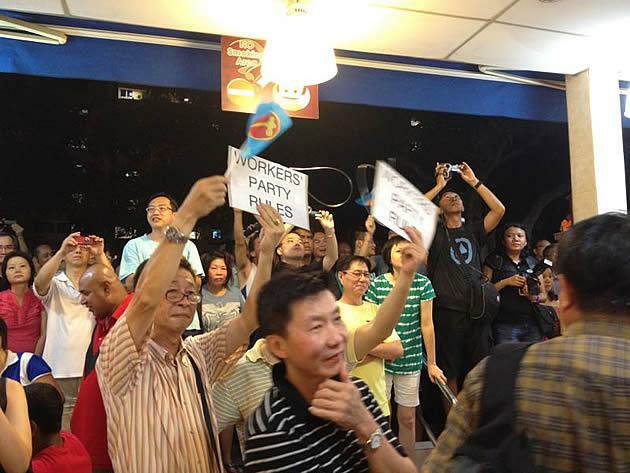 “For the WP, to have lost Hougang would have been morale-deflating; the win in Hougang allows them to steadily build up their ranks pursuant to their larger goal of being a constructive opposition, one which may grow quantitatively and qualitatively in terms of effectiveness as a check on government,” Thio added. For his part, political analyst Derek da Cunha said the results did not surprise him and were within his expectations. Referring to the challenges the WP had faced over the Yaw Shin Leong fiasco and rumours of an internal split, da Cunha said the WP still had a "significant premium on its brand". "No other party could have surmounted these [challenges] and still prevail. The other opposition parties would have wilted," he said. "Going forward one should be under no illusions that as it remains the opposition party in the ascendant, the WP could face further attempts by unknown forces to destabilize it. That is a possibility," he added. Looking ahead, da Cunha said while the next general election may be challenging for the opposition, he expects the WP may "still be able to make further inroads, in areas adjacent to its Hougang and Aljunied strongholds." He also predicts the next election to be held in 2015 – a year more favourable to the PAP – when Singapore celebrates its 50th National Day and when you can expect the government to roll out a raft of populist measures with considerable electoral appeal,” said da Cunha.